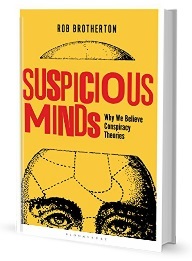 A recent poll by ‘Public Polling Policy’, (despite the name, a private US polling company) conducted an automated telephone poll of 1247 registered US voters and asked respondents a variety of questions about their belief in various popular conspiracy theories. The topline results are available here and are well worth exploring in detail. The main focus of the research was to measure conspiracy belief across party lines (Democrat vs Republican) as well as to provide a general background measure of conspiracy belief in specific theories. The results were interesting (and sometimes contradictory compared to other polls), but helped to cause many sensational (and occasionally misleading) headlines around the world. There are several important things to note here when we consider these results. This was a poll of registered voters – an important distinction if we assume that one of the correlates of conspiracy belief, political cynicism/apathy is relevant. If conspiracy believers feel that the world is being controlled by a malevolent group, or that the government is corrupt, they may not be registered to vote as they may feel there is little point. Another distinctive point to make is that conspiracy belief is often seen to be higher among ethnic minorities, whom, especially in the US, may not necessarily be registered voters. Apart from the potential sampling errors, we have to consider very specifically how these types of questions are asked. Conspiracy theories are multi-faceted and multi-dimensional in their focus, but at their core, boil down to five or six key components. As a result, the wording of a question to discuss a particular kind of conspiracy theory may inadvertently skew results. This does not cover any conspiracy directly. It doesn’t cover governments covering their existence up, denying they exist, or any influence aliens may have over the general population. Many notable physicists and scientists believe in the existence of aliens; it could be considered a statistical hubris to assume we are alone in the universe – but the idea that aliens have visited Earth and/or governments attempt to conceal this is a complete separate belief that is far more closely related to conspiracist ideation. The low results to this question surprised many and perhaps can be explained because most of the conspiracy theories surrounding 9/11 maintain that rather than letting it happen, the government (or corrupt elements thereof) planned and carried out the attacks instead. This is an important ideological and political point and represents a very different type of conspiracy, one which perhaps is more commonly believed. Other polls have often asked questions that relate directly to the government planning and carrying out the attacks, rather than ‘letting them happen’. So, while the discussion continues about the accuracy of these latest results, and the concern that 21% of voters apparently believe President Obama is the Anti-Christ, it is important to recognise the potential problems and pitfalls about sampling and constructing this type of data without the proper consideration for this complex and often contradictory area of belief. This entry was posted in 9/11, Round-Ups, Social psychology, What's the harm, World events and tagged 9/11, 9/11 Truth, aliens, anti-christ, democrat, government, obama, polls, public polling policy, republican, roswell, US, USA. Bookmark the permalink. I’m not being specific on people in power to be designated to be the one who starts this “rapture palooza” or labeled as the anti0christ but I do understand that these people including the previous ones in office are mere puppets and answers to a higher group of selected elite who we can call the Illuminati. I have a good idea, rather than wasting your time on all this ‘anti-conspiracist’ nonsense, why don’t you put some effort into identifying the conspirators?